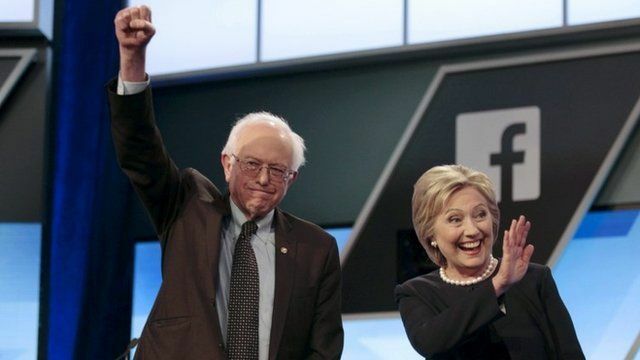 Sanders and Clinton chase Florida voters Jump to media player Democratic US presidential hopefuls Bernie Sanders and Hillary Clinton unite against Donald Trump in a televised debate held in Miami. Democrats clash over US car industry Jump to media player Bernie Sanders and Hilary Clinton clashed over their positions on the bailout given to the US car manufacturing industry in their debate in Michigan. Trump tightens grip in Republican race Jump to media player Donald Trump has strengthened his on the Republican nomination, while Bernie Sanders inflicts shock defeat in Michigan. Democratic US presidential hopefuls Bernie Sanders and Hillary Clinton unite against Donald Trump in a televised debate held in Miami. Voters in Florida go to the polls on Tuesday to select their Democratic nominee to challenge for the White House. The debate was hosted by Univision and the Washington Post.